I’m quoted in Robert Morris’ front-page story for the Gambit, “Seeking a third: Louisiana’s Libertarian and Green parties.” Give it a look, and if you’re interested in helping to build an electoral expression of the movements for justice, ecology, democracy and peace, then please join us for the next Green Party of New Orleans meeting. Thus, much of the Greens’ local work to date involves networking with other established progressive groups in New Orleans. 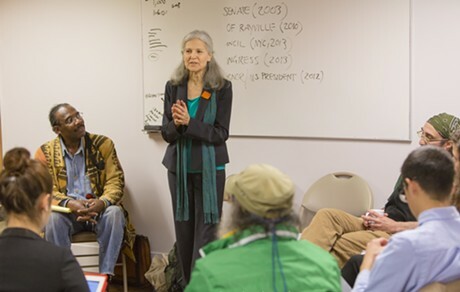 The Greens have participated in protests against new oil drilling leases in the Gulf of Mexico, and they see the work of the Orleans Parish Prison Reform Coalition as a logical ally, even discussing the possibility of running candidates for Orleans Parish sheriff, specifically to protest the record of Sheriff Marlin Gusman. “At the national level, people are saying the most important thing that the Green Party can do is run Black Lives Matter candidates in local elections,” Everson says. The Green Party in New Orleans flourished prior to Hurricane Katrina, Everson says, with a membership so large that it required two meetings per month — one general meeting to discuss the issues and priorities, and a coordinating committee to plan specific actions. The diaspora after the storm scattered many members across the country, though former Black Panther activist Malik Rahim drew some national support for his Green Party bid for Congress against Democratic incumbent Bill Jefferson and Republican Anh “Joseph” Cao in 2008. Green Party presidential candidate Jill Stein attended the Louisiana state convention at Xavier University in 2014. She returned the following year for the 10th anniversary of Hurricane Katrina and hosted a discussion during the Rising Tide conference on organizing a progressive movement. During that discussion, Everson says, a member of the audience asked whether the Greens had a local chapter in New Orleans — they didn’t. He began organizing monthly meetings. “We’ve established that there’s a huge amount of common ground,” Everson says.